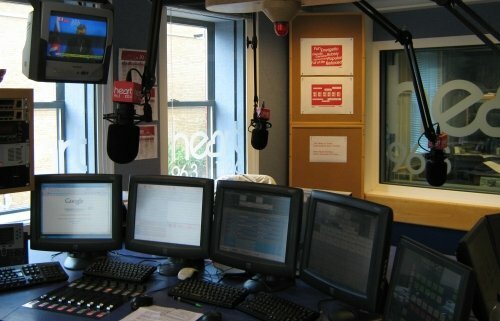 Today, Monday the 22nd June 2009, Essex FM was replaced by “Heart”, taking the total of Heart-branded stations in the UK to 33, and adding networked daytime programming from London. The station re-launched at 6am – first track was Janet Jackson, The Best Things in Life are Free. Here’s a short extract from today’s 6am launch: Heart Essex Relaunch 2.1 Meg MP3. Below is a picture of the main Heart Essex studio in Glebe Road, Chelmsford, rebranded with Heart. As we covered in our recent Essex FM becomes Heart piece, many will see the transition to the Heart corporate brand as a sad day for local radio in Essex after 27 years of Essex Radio and Essex FM. Got a comment? Noticed the change? Let us know.